Passengers walk through the Guangzhou South railway station, home to the Wuhan–Guangzhou High-Speed Railway, also known as the Wuguang Passenger Railway (武广客运专线) in Guangzhou, Guangdong Province, China on December 10, 2010. 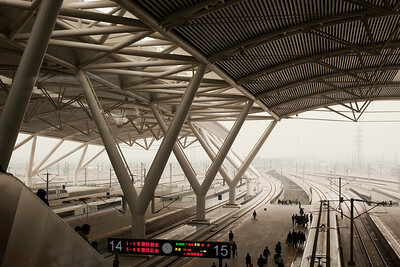 The Guangzhou-Wuhan rail corridor is both the world's longest stretch of high speed rail and home to the world's fastest bullet trains as well. 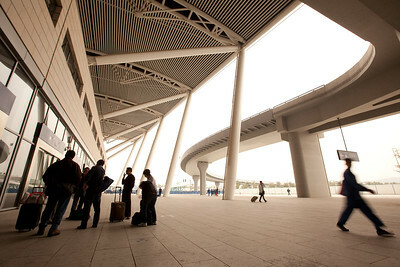 Passengers gather outside the Guangzhou South railway station, home to the Wuhan–Guangzhou High-Speed Railway, also known as the Wuguang Passenger Railway (武广客运专线) in Guangzhou, Guangdong Province, China on December 10, 2010. 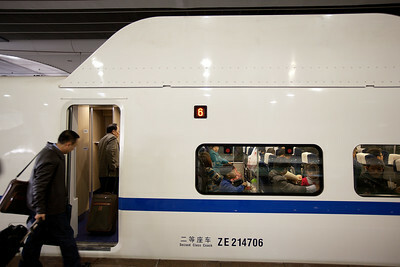 The Guangzhou-Wuhan rail corridor is both the world's longest stretch of high speed rail and home to the world's fastest bullet trains as well. 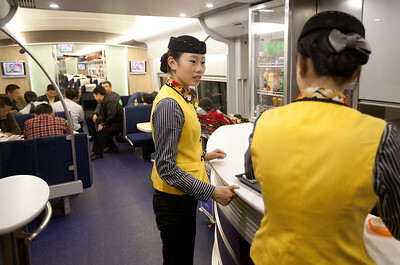 Train crew members work aboard a Wuhan-bound train on the Wuhan–Guangzhou High-Speed Railway, also known as the Wuguang Passenger Railway (武广客运专线) in Guangzhou, Guangdong Province, China on December 10, 2010. 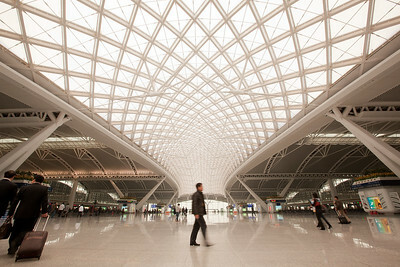 The Guangzhou-Wuhan rail corridor is both the world's longest stretch of high speed rail and home to the world's fastest bullet trains as well. 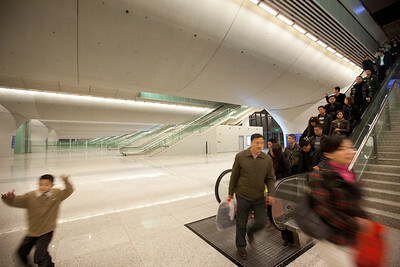 People queue to buy tickets at the Guangzhou South railway station, home to the Wuhan–Guangzhou High-Speed Railway, also known as the Wuguang Passenger Railway (武广客运专线) in Guangzhou, Guangdong Province, China on December 10, 2010. 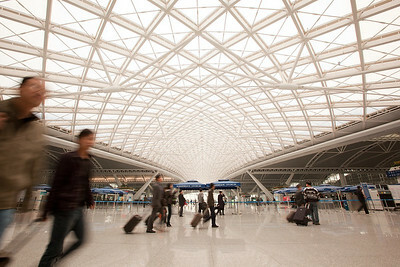 The Guangzhou-Wuhan rail corridor is both the world's longest stretch of high speed rail and home to the world's fastest bullet trains as well. 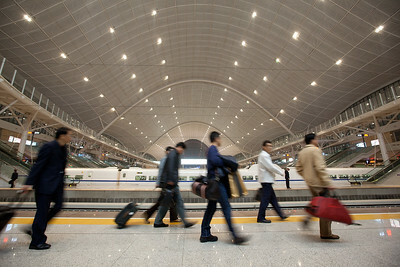 Passengers board a train at the Guangzhou South railway station, home to the Wuhan–Guangzhou High-Speed Railway, also known as the Wuguang Passenger Railway (武广客运专线) in Guangzhou, Guangdong Province, China on December 10, 2010. The Guangzhou-Wuhan rail corridor is both the world's longest stretch of high speed rail and home to the world's fastest bullet trains as well. 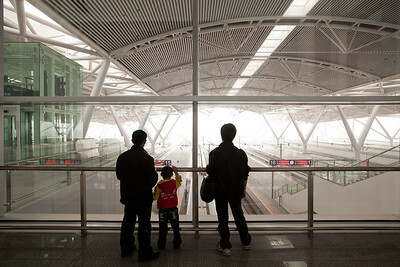 Passengers look out a window at the Guangzhou South railway station, home to the Wuhan–Guangzhou High-Speed Railway, also known as the Wuguang Passenger Railway (武广客运专线) in Guangzhou, Guangdong Province, China on December 10, 2010. The Guangzhou-Wuhan rail corridor is both the world's longest stretch of high speed rail and home to the world's fastest bullet trains as well. 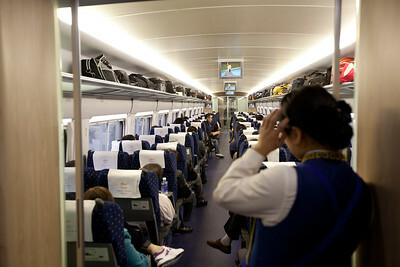 A train crew member looks out over a cabin on a Wuhan-bound train on the Wuhan–Guangzhou High-Speed Railway, also known as the Wuguang Passenger Railway (武广客运专线) in Guangzhou, Guangdong Province, China on December 10, 2010. The Guangzhou-Wuhan rail corridor is both the world's longest stretch of high speed rail and home to the world's fastest bullet trains as well. 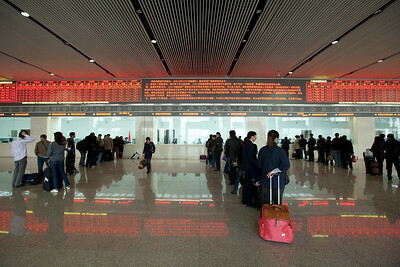 Passengers arrive at the Wuhan Railway Station, the northern terminus of the Wuhan–Guangzhou High-Speed Railway, also known as the Wuguang Passenger Railway (武广客运专线), a service of China Railway High-speed (CRH) in Wuhan, Hubei Province, China on December 10, 2010. The Guangzhou-Wuhan rail corridor is both the world's longest stretch of high speed rail and home to the world's fastest bullet trains. 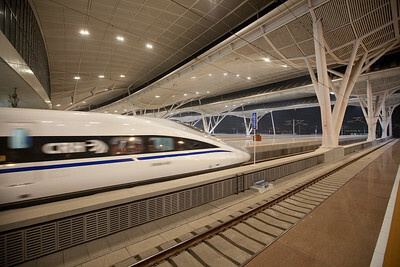 A China Railway High-speed (CRH) train arrives at the Wuhan Railway Station, the northern terminus of the Wuhan–Guangzhou High-Speed Railway, also known as the Wuguang Passenger Railway (武广客运专线), in Wuhan, Hubei Province, China on December 10, 2010. The Guangzhou-Wuhan rail corridor is both the world's longest stretch of high speed rail and home to the world's fastest bullet trains. 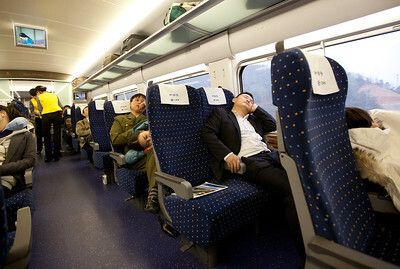 Passengers sleep aboard a Wuhan-bound train on the Wuhan–Guangzhou High-Speed Railway, also known as the Wuguang Passenger Railway (武广客运专线) in Guangzhou, Guangdong Province, China on December 10, 2010. 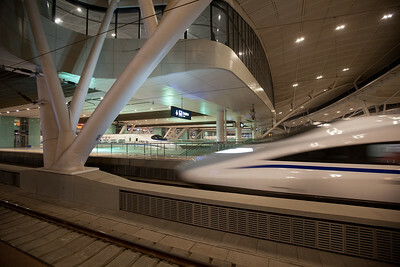 The Guangzhou-Wuhan rail corridor is both the world's longest stretch of high speed rail and home to the world's fastest bullet trains as well.